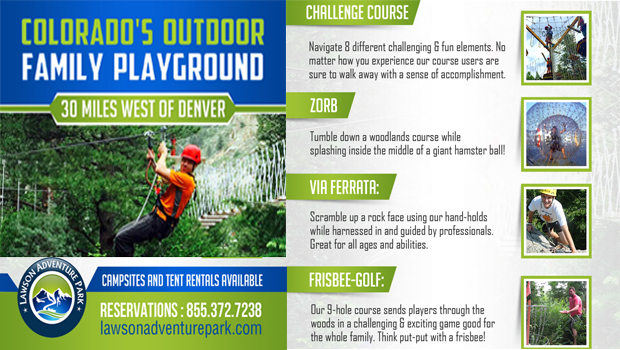 We are a family friendly outdoor adventure park in the heart of Rockies offering activities that include ZORB, Challenge Course, Via Ferrata, Frisbee-Golf, Bungee Tramp, Gyro Machine, Spider Wall and much more. Just 30 minutes west of Denver off of I-70 between Idaho Springs and Georgetown. Come to Lawson Adventure Park and receive 20% Off activities! We have ZORBS, Challenge Course, Via Ferrata, Frisbee golf and more. Please mention code 20CK when booking your adventure. *Some exclusions apply.